Steatosis, also called fatty change, is the process describing the abnormal retention of lipids within a cell or organ. When not further specified (such as cardiac steatosis), it is defined as affecting the liver. It reflects an impairment of the normal processes of synthesis and elimination of triglyceride fat. Excess lipid accumulates in vesicles that displace the cytoplasm. When the vesicles are large enough to distort the nucleus, the condition is known as macrovesicular steatosis; otherwise, the condition is known as microvesicular steatosis. While not particularly detrimental to the cell in mild cases, large accumulations can disrupt cell constituents, and in severe cases the cell may even burst. Micrograph demonstrating marked (macrovesicular) steatosis in non-alcoholic fatty liver disease. Masson's trichrome stain. The risk factors associated with steatosis are varied, and include diabetes mellitus, protein malnutrition, hypertension cell toxins, obesity, anoxia, and sleep apnea. As the liver is the primary organ of lipid metabolism it is most often associated with steatosis (fatty liver disease); however, it may occur in any organ, commonly the kidneys, heart, and muscle. No single mechanism leading to steatosis exists; rather, a varied multitude of pathologies disrupt normal lipid movement through the cell and cause accumulation. These mechanisms can be separated on whether they ultimately cause an oversupply of lipid which can not be removed quickly enough (i.e., too much in), or whether they cause a failure in lipid breakdown (i.e., not enough used). Failure of lipid metabolism can also lead to the mechanisms which would normally utilise or remove lipids becoming impaired, resulting in the accumulation of unused lipids in the cell. Certain toxins, such as alcohols, carbon tetrachloride, aspirin, and diphtheria toxin, interfere with cellular machinery involved in lipid metabolism. In those with Gaucher's disease, the lysosomes fail to degrade lipids and steatosis arises from the accumulation of glycolipids. Protein malnutrition, such as that seen in kwashiorkor, results in a lack of precursor apoproteins within the cell, therefore unused lipids which would normally participate in lipoprotein synthesis begin to accumulate. Macrovesicular steatosis is the more common form of fatty degeneration and may be caused by oversupply of lipids due to obesity, obstructive sleep apnea (OSA), insulin resistance, or alcoholism. Nutrient malnutrition may also cause the mobilisation of fat from adipocytes and create a local oversupply in the liver where lipid metabolism occurs. Excess alcohol over a long period of time can induce steatosis. The breakdown of large amounts of ethanol in alcoholic drinks produces large amounts of chemical energy in the form of NADH, signalling to the cell to inhibit the breakdown of fatty acids (which also produces energy) and simultaneously increase the synthesis of fatty acids. This "false sense of energy" results in more lipid being created than is needed. Microvesicular steatosis is characterized by small intracytoplasmic fat vacuoles (liposomes) which accumulate in the cell. Common causes are tetracyclines, acute fatty liver of pregnancy, Reye's syndrome, and hepatitis C.
Histologically, steatosis is physically apparent as lipid within membrane bound liposomes of parenchymal cells. When this tissue is fixed and stained to be better viewed under a microscope, the lipid is usually dissolved by the solvents used to prepare the sample. As such, samples prepared this way will appear to have empty holes (or vacuoles) within the cells where the lipid has been cleared. Special lipid stains, such as Sudan stains and osmium tetroxide are able to retain and show up lipid droplets, hence more conclusively indicating the presence of lipids. Other intracellular accumulations, such as water or glycogen, can also appear as clear vacuoles, therefore it becomes necessary to use stains to better decide what is accumulating. Grossly, steatosis causes organ enlargement and lightening in colour. This is due to the high lipid content increasing the organ's volume and becoming visible to the unaided eye. In severe cases, the organ may become vastly enlarged, greasy, and yellow in appearance. Histological section of a mouse's liver showing severe steatosis. The clear vacuoles contained lipid in life; however, histological fixation caused it to be dissolved and hence only empty/clear spaces are seen. 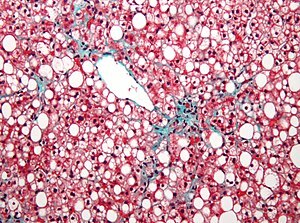 Micrograph of fatty liver showing lipid steatosis. H&E stain. On X-ray computed tomography (CT), the increased fat component will decrease the density of the liver tissue, making the image less bright. Typically the density of the spleen and liver are roughly equivalent. In steatosis, there is a difference between the density and brightness of the two organs, with the liver appearing darker. On ultrasound, fat is more echogenic (capable of reflecting sound waves). The combination of liver steatosis being dark on CT and bright on ultrasound is sometimes known as the flip flop sign. On Magnetic Resonance Imaging, multiecho gradient echo images can be used to determine the percent fat fraction of the liver. The different resonance frequencies between water and fat make this technique very sensitive and accurate. Acquisition of echoes in "in phase" and "out phase" conditions (pertaining to the relative phases of the fat and water proton contingents) enables to obtain a signal proportional to the water and fat contingent, or a signal proportional to the water minus the fat contingent. These signal intensities are then algebraically combined into a percent fat. More recent techniques take into account experimental noise, signal decay and spectroscopic properties of fat. Numerous validation studies have demonstrated excellent correlations between the steatosis level quantified at MRI and the steatosis levels semi-quantitavely and quantitatively determined on liver biopsies (reference methods). Several MRI vendors offer automated calculation of percent fat with acquisition sequences no longer than a single breath hold. On abdominal ultrasonography, steatosis is seen as a hyperechoic liver as compared to the normal kidney. 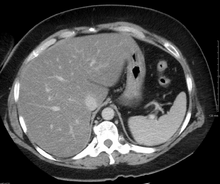 Liver steatosis (fatty liver disease) as seen on MRI. Multiecho MR sequence in a healthy liver (top row) and a liver with severe steatosis (bottom row) are shown. In the healthy liver, the signal does not vary much in the different echoes. In the steatotic liver, the signal varies greatly between in and out phase echoes. Algebraic combination of these images can be used to accurately quantify liver steatosis. Abdominal ultrasonography with the liver and kidney side by side (left image) may give a false impression of hyperechogenic liver, so it's preferably done with the organ borders facing the ultrasound probe (right image, of the same case). Abdominal ultrasonography of focal steatosis. It is distinguished from a tumor by not compressing the hepatic vein. ^ "steatosis". Farlex Dictionary. Retrieved 2019-01-03. ^ "steatosis". Oxford dictionaries. Retrieved 2019-01-03. ^ Araya Q AV, Valera M JM, Contreras BJ, Csendes JA, Díaz J JC, Burdiles PP, Rojas CJ, Maluenda GF, Smok SG, Poniachik TJ (September 2006). "Glucose tolerance alterations and frequency of metabolic syndrome among patients with non alcoholic fatty liver disease". Rev Med Chil (in Spanish). 134 (9): 1092–8. PMID 17167710. ^ Ali ES, Hua J, Wilson CH, Tallis GA, Zhou FH, Rychkov GY, Barritt GJ (September 2016). "The glucagon-like peptide-1 analogue exendin-4 reverses impaired intracellular Ca(2+) signalling in steatotic hepatocytes". Biochim. Biophys. Acta. 1863 (9): 2135–46. doi:10.1016/j.bbamcr.2016.05.006. PMID 27178543. ^ Conde Martel A, González Reimers E, Santolaria Fernández F, Castro Alemán V, Marchena Gómez J, Martínez Riera A (1993). "Liver changes in protein malnutrition. An experimental study in rats". Nutr Hosp (in Spanish). 8 (6): 358–63. PMID 8373879. ^ Brookes MJ, Cooper BT (April 2007). "Hypertension and fatty liver: guilty by association?". J Hum Hypertens. 21 (4): 264–70. doi:10.1038/sj.jhh.1002148. PMID 17273155. ^ Saadeh S (February 2007). "Nonalcoholic Fatty liver disease and obesity". Nutr Clin Pract. 22 (1): 1–10. doi:10.1177/011542650702200101. PMID 17242448. ^ a b c d Cotran; Kumar, Collins (1998). Robbins Pathologic Basis of Disease. Philadelphia: W.B Saunders Company. ISBN 0-7216-7335-X. ^ Ahmed MH, Byrne CD (September 2010). "Obstructive sleep apnea syndrome and fatty liver: association or causal link?". World J. Gastroenterol. 16 (34): 4243–52. doi:10.3748/wjg.v16.i34.4243. PMC 2937104. PMID 20818807. ^ Singh H, Pollock R, Uhanova J, Kryger M, Hawkins K, Minuk GY (December 2005). "Symptoms of obstructive sleep apnea in patients with nonalcoholic fatty liver disease". Dig. Dis. Sci. 50 (12): 2338–43. doi:10.1007/s10620-005-3058-y. PMID 16416185. ^ Tanné F, Gagnadoux F, Chazouillères O, Fleury B, Wendum D, Lasnier E, Lebeau B, Poupon R, Serfaty L (June 2005). "Chronic liver injury during obstructive sleep apnea". Hepatology. 41 (6): 1290–6. doi:10.1002/hep.20725. PMID 15915459. ^ Wilson CH, Ali ES, Scrimgeour N, Martin AM, Hua J, Tallis GA, Rychkov GY, Barritt GJ (March 2015). "Steatosis inhibits liver cell store-operated Ca²⁺ entry and reduces ER Ca²⁺ through a protein kinase C-dependent mechanism". Biochem. J. 466 (2): 379–90. doi:10.1042/BJ20140881. PMID 25422863. ^ Bhattacharjee R, Gozal D (September 2010). "Metabolic disease in sleep disordered breathing: puberty! puberty!". Sleep. 33 (9): 1133–4. PMC 2938852. PMID 20857857. ^ Reeder SB, Cruite I, Hamilton G, Sirlin CB (October 2011). "Quantitative Assessment of Liver Fat with Magnetic Resonance Imaging and Spectroscopy". J Magn Reson Imaging. 34 (4): spcone. doi:10.1002/jmri.22775. PMC 3177109. PMID 22025886.